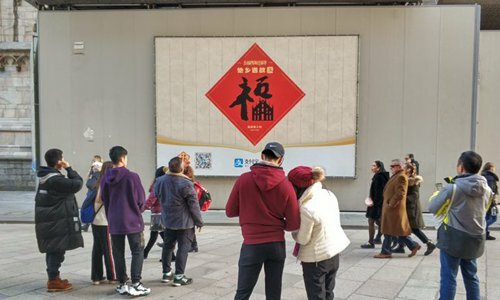 Chinese tourists gathered around an Alipay campaign poster outside Milan Cathedral during the 2019 Lunar New Year holiday. Outbound travelers from third- and fourth-tier cities registered faster growth in their purchases through Alipay than those from the top-tier cities such as Beijing and Shanghai, Alibaba's third-party payment platform Alipay said. The trend shows that the habit of using mobile payments is expanding to older consumers in China's smaller cities. Alipay analyzed the figures as China's week-long Lunar New Year celebrations came to an end on Sunday. Middle-aged travelers, or those born in the 1960s and 1970s, were the driving force in outbound tourism and overseas consumption. The number of Alipay users born in the 1960s increased 230 percent year-on-year and total consumption by this age group increased 250 percent year-on-year, the company said. The growth rates were the highest among all age group categories. "We are excited to see the robust growth in the use of Alipay by overseas travelers from third- and fourth-tier cities and middle-aged vacationers. This really highlights how mobile payments are taking root in China's outbound tourism market," said Janice Chen, an executive at Alipay. The findings were drawn from more than 40 countries and regions. The findings showed that older travelers are catching up with their younger peers when it comes to using mobile payments, and they are also the most significant spenders while traveling abroad.